Bring out your talent to the church on Fri., Nov 18 between 7 and 9 pm. 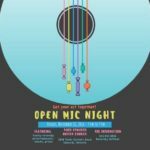 Have your chance to play a song, tell a story, share some jokes, or whatever it is that you do best. Or just come for an evening of entertainment. Everyone is welcome!